The battle of Marathon took place during the first Persian invasion in 490 BC. The Persian army of King Darius I was attempting to conquer Greece because the Greeks had involved themselves in the failed Ionian revolt against Persian rule. The Persian forces sailed across the Aegean besieging and capturing Eretria before landing near the plain of Marathon about 40km from Athens. The Athenian forces, joined by a small contingent of Plataians were heavily outnumbered by the Persians. Modern estimates place the Greek numbers at approximately 10,000 Athenians and 1,000 Plataians facing the Persian forces numbering about 26,000 (1,000 of which were cavalry). Marathon was not the most appropriate terrain for the Persian forces who were unable to make effective use of their cavalry. The Greek commander Miltiades conceived a clever strategy and weakened the centre of his forces which were opposed by the strongest of the Persian forces. 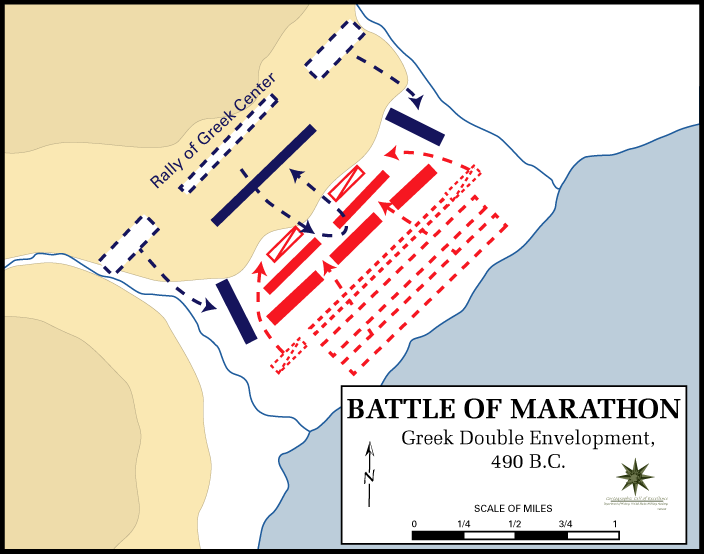 This ensured that Persian forces were able to push the centre of the Greek line back, but the reinforced flanks of the Greek army were able to hold their ground. Leading to the Persian forces being enveloped and routed. Herodotos tells us that the Greeks lost a total of 192 Greeks and 11 Plataians whereas the Persians losses amounted to 6,400 troops and 7 warships. See feature story about the armour worn by the Greeks during this battle.